Your boxed turkey, complete with pop-up timer and recipe leaflet will be ready for collection on 23rd and 24th December, between 8.00 am and 5.00 pm. By arrangement, turkeys can be collected at an earlier or later date. Turkeys can also be prepared for Thanksgiving - collection in November. Payment on collection by cash, cheque or debit/credit card please. This method should help you produce a truly tasty turkey with especially succulent breast meat. Remember that the white (breast) meat of the turkey cooks quicker than the dark (leg) meat and wings, so it is best to cook your turkey breast side down to start with. This should keep the juices in the breast and prevent it from becoming too dry. Another tip for even cooking is to loosen the trussing. If you wish to stuff your turkey, prepare your favourite stuffing recipe and fill the neck cavity only. You may like to put a large Bramley apple or peeled onion into the body cavity. Sprinkle the bird with salt and pepper then place it breast side down (covered with foil if you prefer) in a roasting tin. The oven should be pre-heated to 230°C/450°F/Gas mark 8 and the bird cooked at this temperature for 30 to 60 minutes depending on size, before reducing the heat to 190°C/375°F/Gas mark 5. 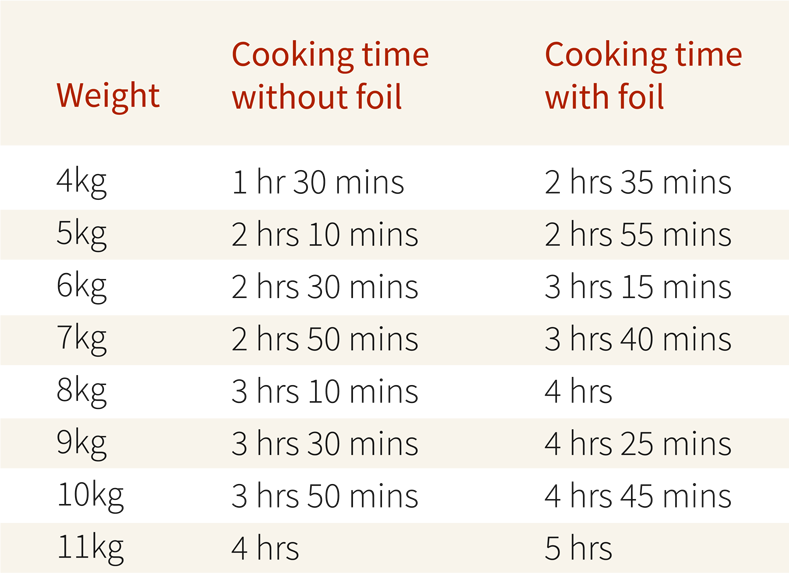 About 30 minutes before the end of cooking (see table below for suggested total times), open the foil if used and turn the bird onto its back to brown the breast. Do try to avoid over-cooking. Test with a fork on the inside of the thigh, ensuring that clear juice comes out of the thigh when you pierce. After removing the turkey from the oven and before carving, allow it to rest for at least 30 minutes.